KawaiiPunk - Kawaii Mascot Blog: Pirates and Petticoats! Weirdly Wonderful! 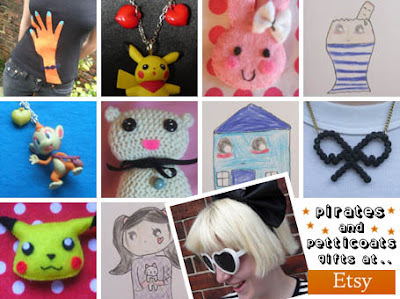 Pirates and Petticoats is an Etsy shop that is nothing short of eclectic crafting genius! Hand drawn cards sit happily next to loveheart speech bubbles while contented Pokemon pendants look on. Spiderman bags, ruffle skirts, and crayon necklaces are also in attendance. A perfect place to pick up an unusually cute and unique gift! This Freak absolutely loves it!